Otogirisou, the original by Chunsoft. Uses SFC graphics and has a movie based on it. Kamaitachi no Yoru, the evolution by Chunsoft, serial murders at a ski lodge, uses photos with silhouettes of people. The most famous one with several sequels. Yakouchuu, about people on a ship who get killed... that's about it. and as a bonus, Silent Hill Playnovel for GBA. As far as I know just the game as a sound novel, but with maybe some extra scenarios. Anyone "played" any of these? They're more like books than games, the only interaction usually being choosing what action the protagonist takes or which line he says, kind of like Mass Effect etc later on, like do you want the regular reply or the sort of dickish reply? So far I've played Otogiriso and Yakouchuu. Sure I've played a lot of sound novels, but out of those listed I only have Sound Novel Tsukuuru. I meant to play some of those since forever but I still haven't. 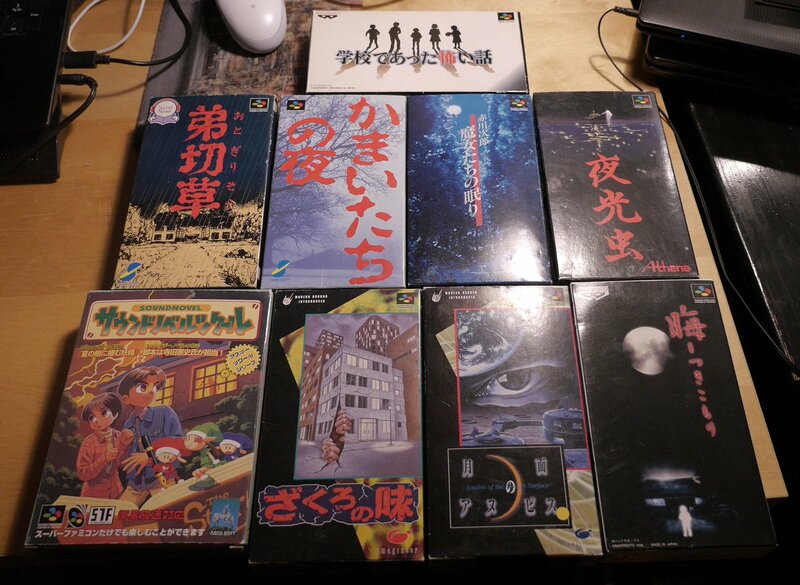 Also I would like to get a data cartridge to use with Sound Novel Tsukuuru (and other games that use them) but they are very expensive and quite rare (on ebay at least). Yeah pure sound novels (and visual novels which is basically the same thing but with more graphic, Chunsoft trademarked the "sound novel" term) has little to no interactivity and are really digital novels with sound and visual elements. You might struggle to call them games. Some sound novels mixes in other genres though. I love the genre. Really good games captures you totally like a really good book. I have the first two you mentioned CIB but only because I simply love the packaging design. I can't play them at all so I'm not reaally sure what to do with them. 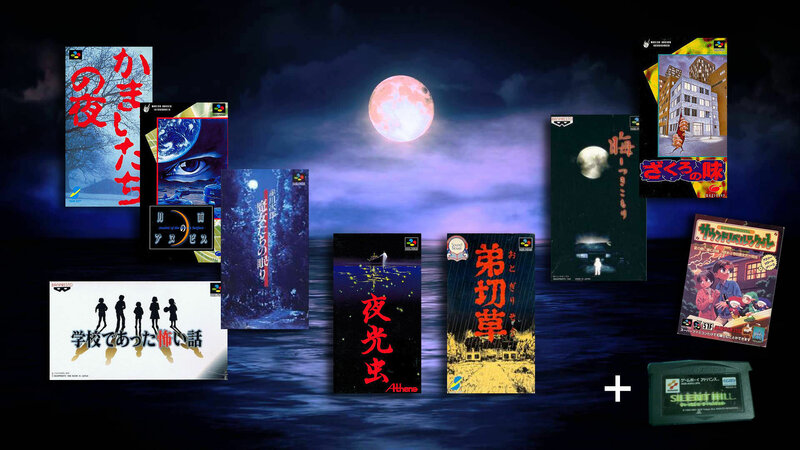 Interestingly, Otogirisou was mentioned by many, many Japanese developers asked what title(s) they felt missing from the Super Famicom Mini. It was a popular game it seems at the time, it surprised me to see just how popular. If it's easy and fast, I would love to hear what these titles translate as into English. It's not that easy really but here's my stab at it. Otogiriso - 弟切草 - This is the name of a flower known in english as St. Johns Wort, according to the japanese story of the name anyway it got the name because a brother (弟)killed (切, cut his throat) and the blood spilled on the flower (草 although this means grass) and that's why the flower has black spots. Kamaitachi no yoru かまいたちの夜 - Night of the kamaitachi.. Titles have been suggested as "night of the sickle weasel, or banshee's last cry, the second one being just wrong imo, but I don't know how to translate kamaitachi at all because it's the name of a japanese folklore monster who cuts it's victim with razor-like claws or something. Tsukikomori - 晦-つきこもり - The kanji is the title, the hiragana is just how to read it. Apparrently it means the last day of the month. Yakouchuu - 夜光虫 - Night, light, insect. Apparently the name of a sea phenomenon when a kind of organism that sometimes emits a blue light. Zakuro no aji - ざくろの味 - The taste of pomegranate. Hah. No idea how that relates to the game yet. Getsumen no anubis - 月面のアヌビス - Anubis of the moons surface, anubis is from egyptian mythology, the game takes place on a moon base. Kamaitachi is a Japanese yokai. Kama means sickle and itachi means weasel so yeah it really means sickle-weasel. According to legends kamaitachi comes in groups of three and runs very fast causing a whirlwind. The first knocks you down, the second cuts you up with his sickle (depending on the depiction, the sickle may be a real sickle tool or sickle-shaped parts of his claws) and the third one heals your wounds, only leaving the scar. It's a tale that explains why cuts caused by vacuum pockets from whirlwinds causes strange wounds that does not bleed. Kamaitachi is a common name in games for wind-based attacks that cuts with vacuum slices, although sometimes it is translated to something else in English. Sickle weasel sounds kinda stupid, maybe that's why they try various other translations for it. Kamaitachi I am familiar with, thank you - I didn't know it was the yokai in this case. That makes me want to play the game more! Anyone that had played Ghost and Goblins should know exactly what this animal looks like - they're the whirlwind enemy that you see on stage 1. I quite like this kind of literal description. I can't speak Japanese, but often see that, where as Chinese for example has more elaborate / symbolic descriptions. It is written in hiragana but I think that is how it usually is written. I haven't played the game yet, but since it's a murder mystery I guess the kamaitachi is figurative rather than a real yokai appearing in the game. It seems a port of it got an English release and named Banshee's last cry. It's just a localized title, not any kind of translation of the Japanese title. Love the artwork on these - especially the top row blue one which I'm missing. Many Japanese developers included one of those in their top titles they think the SFC Mini was missing. Is the one bottom left a BSX exclusive? sound novel though, written by Kenji Terada, scenario writer for Final Fantasy 1-3! Yeah the data cartridge is used with about any Super Famicom game that has a these small cartridge slots on top of the cartridge. The Tsukuuru (or "Tkool" as it's also stylized as) series often use those so you can share your games with others, and as Protoman said, share sound data made in Ongaku Tsukuuru. The Satellaview also broadcasted games from competitions and the like so that they could be downloaded on a data cart. Some can be found online and some has been converted to a normal ROM so they can be played in a flashcart or emulator. BTW I really have to get around to play Otogirisou! Only two more of these to play on SFC(not to completion, just one round of the story) before I can move on to Machi on PS1 and the Silent Hill one..